Because our original discussion was focus solely on the theme parks I wanted to expand on that discussion and talk about some of the best bars at the resort hotels. There are a lot of unique bar experiences at the Walt Disney World hotels, some of which are worth visiting even if you aren’t staying at that particular resort. The Grand Floridian Resort & Spa is the flagship resort at Walt Disney World. 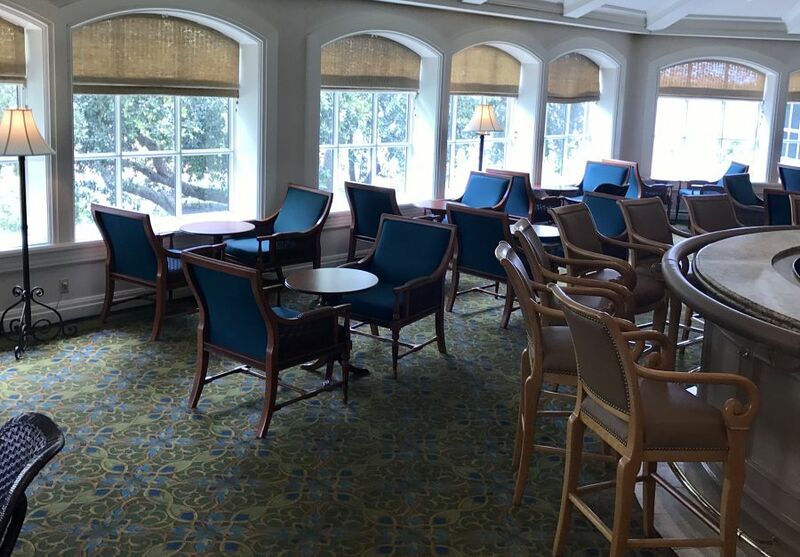 Tucked away on the second floor of the massive lobby is Mizner’s Lounge. This unassuming bar is small and doesn’t seem to offer anything special, but if you wait until a little later at night the Grand Floridian Society Orchestra come out to play their nightly set. Being able to enjoy the live band, your company, and a cocktail all in one location makes this one of my favorite bars on property. Outside of that, there aren’t many frills to this bar, but while the band is playing their might not be a better bar on property. 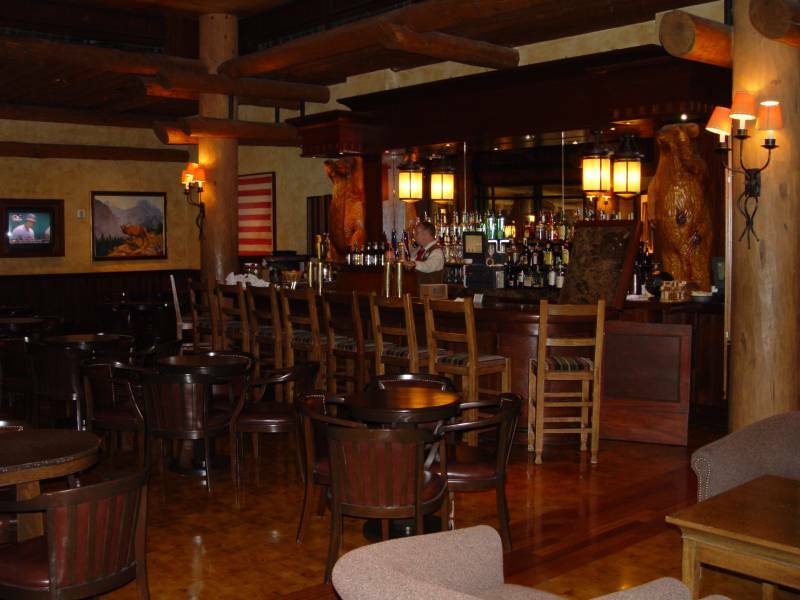 Another unassuming bar that made my list was Territory Lounge at Disney’s Wilderness Lodge. The rustic cabin-y feel of this bar fits in perfectly with the hotel’s theme, and the dark woods and comfortable chairs make this the coziest bar on property. During the day, they serve coffee and sodas, and because I love the atmosphere in here so much I’ve taken my laptop and worked from this location during the day. 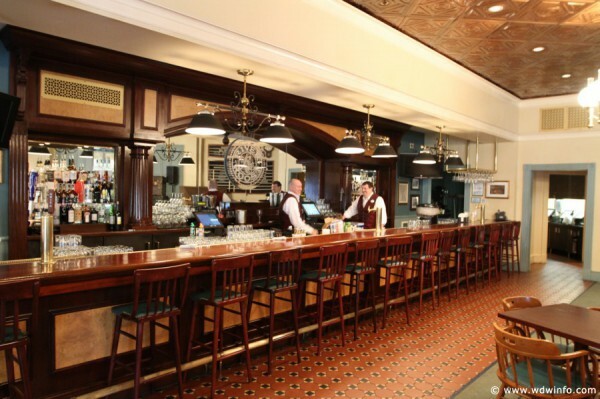 Interestingly this wasn’t the only bar at Disney’s Wilderness Lodge that made this list! The River Roost Lounge at Disney’s Port Orleans – Riverside is the only bar that made my best list that is not at a Deluxe Resort. There are two things that make this bar special. The first is Yehaa Bob Jackson, a zany over the top piano-bar musician who performs his act at the River Roost Lounge a couple times a week. Yehaa Bob has a large following, which fills the River Roost Lounge up quickly. The River Roost Lounge also hosts a trivia night, which gives out prizes. I will warn you that this is extremely difficult trivia, as locals and Disney Parks veterans attend this frequently. This makes winning a round nearly impossible unless you are a Disney trivia expert. There are few places on property that you can forget you’re at Walt Disney World. 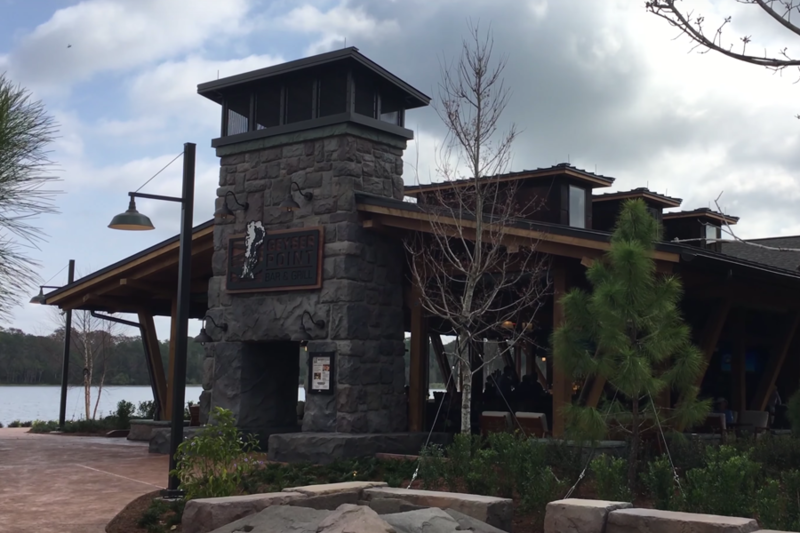 Geyser Point Bar & Grill at Disney’s Wilderness Lodge looks out onto Bay Lake, and it is so peaceful and calm being right next to the water that it transports you away from the hustle and bustle of Walt Disney World. If you’ve never been to Disney’s Wilderness Lodge, and you are thinking of taking a mid-day break this is a great option. Even if you don’t drink you can order food here as well. I was very close to making this bar a tie with what I put at the number 1 spot. The serenity of this location, the food selection, and the cocktails all make this a must-visit location. If someone asked you what makes the Disney Parks and Resorts so special, one of the first things that might come to your mind is the incredible theming. 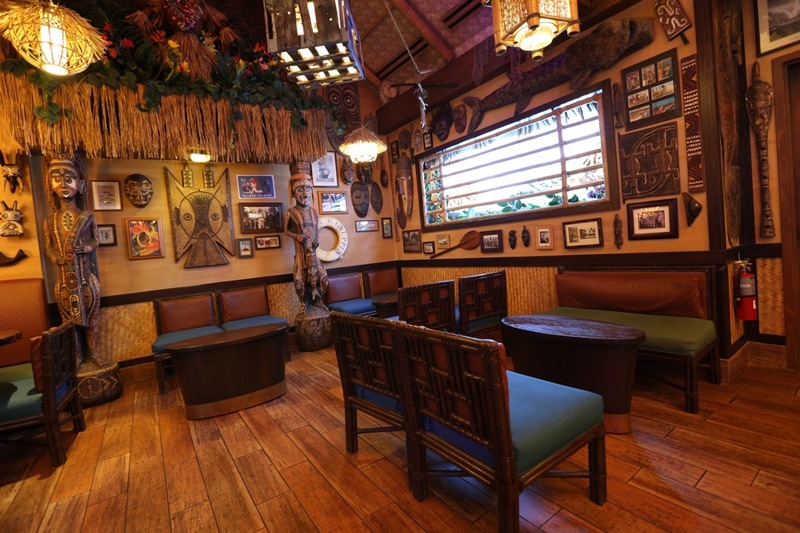 Trader Sam’s Grog Grotto and Tiki Bar is one of the crowning jewels of Disney theming. The level of detail, craftsmanship, and design that went into creating Trader Sam’s Grog Grotto and Tiki Bar is astounding. The drinks are all in theme and the entire experience is extremely immersive. 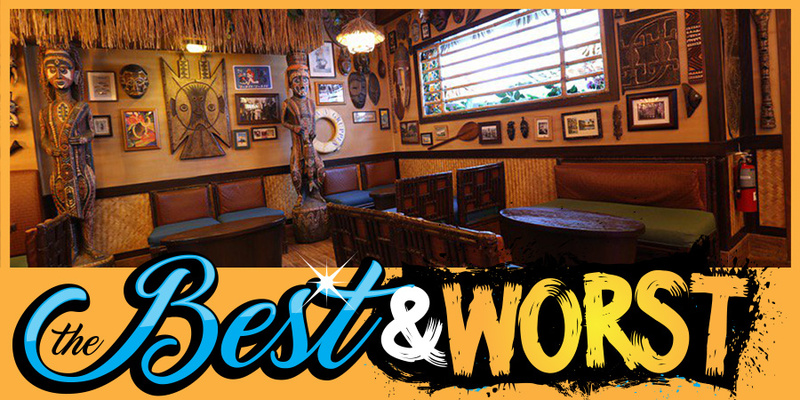 Of course, our Trader Sam’s at Walt Disney World is the second iteration of the popular tiki bar, the first being located outside of the Disneyland Hotel in Anaheim, California. Regardless Trader Sam’s Grog Grotto and Tiki Bar is a must-see at Walt Disney World!